These crispy butterscotch pretzel cookies hit all the right flavor notes. Sweet from the butterscotch, salty and crispy from the pretzel nuggets, and a little chewy in the middle from the brown sugar. The perfect combo for a cookie! 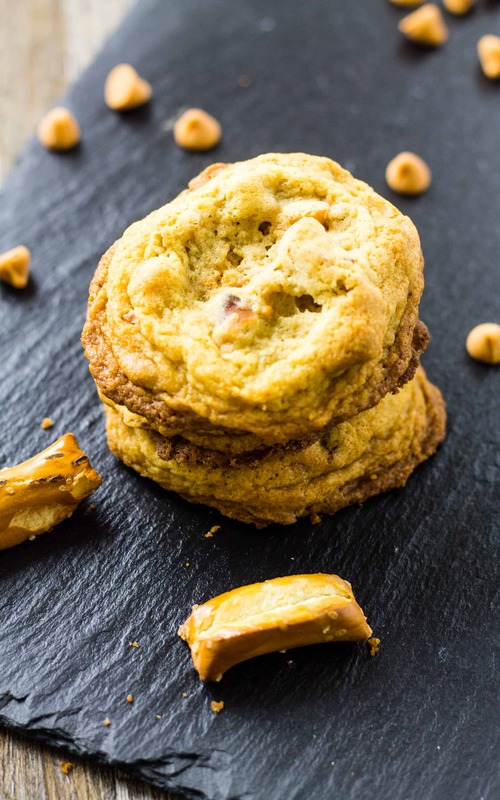 Butterscotch is perfect for cookies with brown sugar! You know when you try and come up with new flavor combinations to try in your cookies and just start throwing things from your pantry into the plain batter and taste away? Am I wrong in thinking that everyone does this? 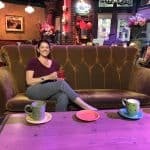 I guess if you are going to do this, you have to have a pretty well-stocked pantry or you will end up with lima bean and peanut butter cookies. No one wants that I can assure you. But if you have kids that love to eat 3/4 of something and put it back never to be finished then you have the right pantry for cookie combination time. Because I make recipes with smaller portions, the bags of chips, pretzels, and candy I buy never get eaten all the way leaving just enough to get wasted or tossed into a kitchen sink kind of recipe. Luckily my cookie dough base is made with all brown sugar for a chewier cookie so butterscotch is a perfect add in! Ever since I got my cookie dough base down to a science, I love changing out the different chocolate chips and either a nut or some other add-in to make different flavor combinations. I have tried dark chocolate and toasted coconut, white chocolate and macadamia nut, and the classic chocolate chips alone. 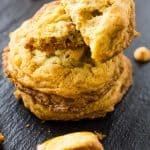 These butterscotch and pretzel cookies are my newest love. Lots of people prefer their butterscotch with oatmeal but I like to keep my oatmeal in my breakfast food and not in my cookies. But I will admit that I have eaten plenty of cookies for breakfast so I really can’t leave the possibility out. The chewy nature of my cookie dough lends itself to need to add crispy textures to balance them out. Enter the pretzels! What goes with Pretzel Nuggets? Not just any pretzel will do in this case. The sticks or twists are still too thin to hold up to the texture of the cookie so when I was making my seasoned pretzel nuggets, I instantly thought of using them in a cookie recipe. The pretzel nuggets are extra crispy and hold a lot of salt on their surface area which is perfect for adding salt and texture to some cookies. The pretzel nuggets don’t require too much smashing, just a few smacks with a mallet to break them into a few pieces and you are good to go. When you mix the chips and pretzel shards in the cookie dough it might look a little lumpy. That’s ok. The pretzel nuggets also don’t like to fit perfectly into my silicone ice cube trays that I normally place my cookie dough in so it’s ok to let the dough chill in a bowl. 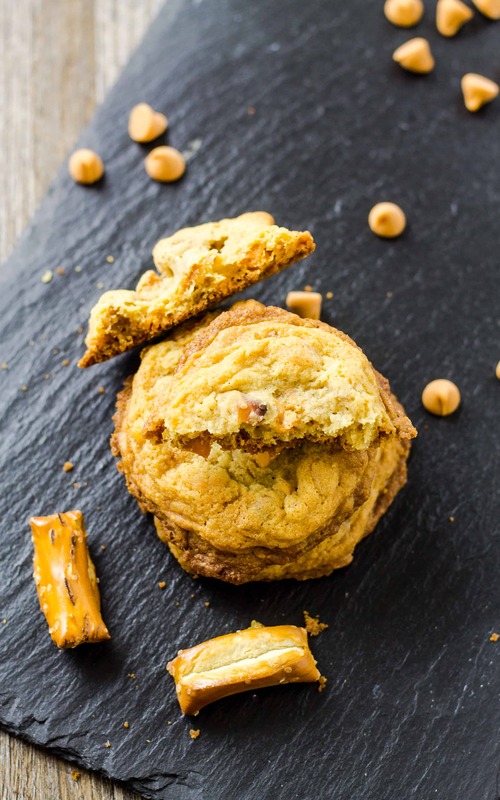 These butterscotch pretzel cookies are just exactly the new flavor combo that you have been looking for all these years! 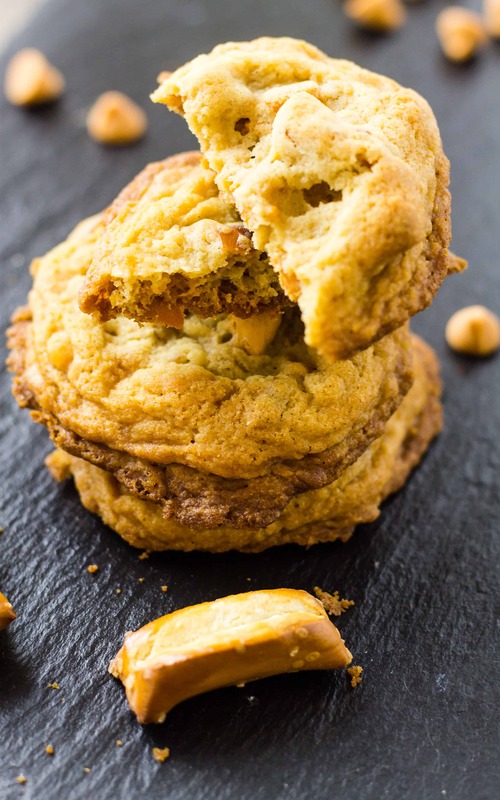 My classic cookie dough base is elevated with butterscotch and smashed pretzel nuggets to make a delightfully sweet and salty cookie! What is your favorite kind of cookie? In a mixing bowl with a stand or hand mixer, cream together the melted butter and the brown sugar until combined. Add the egg, yolk, vanilla, and the milk. In a separate bowl combine the flour, salt, baking powder, and baking soda. Slowly mix in the dry ingredients just until combined. By hand, mix in the butterscotch chips and pretzel nuggets just until mixed. Portion into silicone ice cubes or leave in one big bowl and chill for at least 1 hour. Place cookie portions (approximately 2 tablespoons) on a parchment-lined baking sheet. Bake for 12 minutes or until the edges are golden brown and the centers are set. Remove the pan from the oven and let sit for another 5 minutes. Remove from the baking pan and let cool completely. I love the combination of butterscotch and salty pretzels in the cookies! Not to mention the extra crunch! Just made this recipe and the cookies are divine! Actually dangerously divine! I better get some of these out of my house. My cookies don’t look anything like yours but I’m having trouble with the temperature of my oven right now. No matter still. A true winner, thanks for the recipe, Jennifer!